Haigh JN, Dargaville TD, Dalton PD. 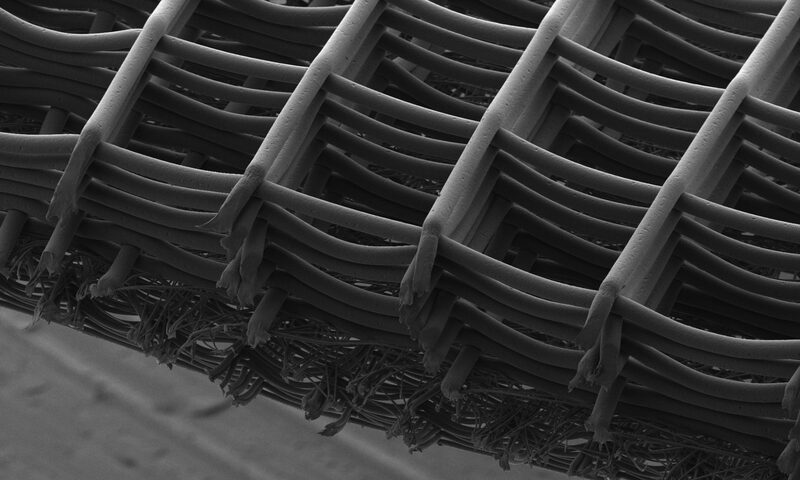 Additive Manufacturing with Polypropylene Microfibers. Mat Sci Eng C (submitted). Wunner FM, Toosisaidy N, Onur B, De-Juan-Pardo EM, Dalton PD, Hutmacher DW Melt Electrospinning Writing of Three-dimensional Poly(ε-caprolactone) Scaffolds with Controllable Morphologies for Tissue Engineering Applications. Journal of Visual Experiments (submitted). Lührmann T, Meinel L, Groll J, Dalton PD. Electrospun Fibers for Drug Delivery. In Ducheyne, K.E. Healy, D.W. Hutmacher, D.W. Grainger, C.J. Kirkpatrick (eds.). Comprehensive Biomaterials Ed.2, Elsevier (in press). Muerza-Cascante ML, Shokoomand A, Khosrotehrani K, Haylock D, Dalton PD, Hutmacher DW, Lössner D. Endosteal-like extracellular matrix expression on melt electrospun written scaffolds, Acta Biomaterialia (in press) http://dx.doi.org/10.1016/j.actbio.2016.12.040. Martine L, Holzapfel BM, Wagner F, Quent VM, Hesami P, Wunner FM, Vaquette C, Juan Pardo E, Brown TD, Nowlan B, L Lévesque JP, Dalton PD, Taubenberger AV, Hutmacher DW (2017) Engineering a humanized bone organ in mice to study bone-related malignancies. Nature Protocols, 12, 639-663. Hochleitner G, Youssef A, Hrynevich A, Haigh J, Jüngst T, Groll J, Dalton PD (2016) Fibre Pulsing During Melt Electrospinning Writing. Bionanomaterials, DOI 10.1515/bnm-2015-0022. Brown TD, Dalton PD, Hutmacher DW (2016) Melt Electrospinning Today- An Opportune Time for an Emerging Polymer Process. Prog Polym Sci, 56, 116–166. Weigand A, Boos AM, Tasbihi K, Beier JP, Dalton PD, Schrauder M, Horch RE, Beckmann MW, Strissel PL, Strick R. (2016) Selective isolation and characterization of primary cells from control breast and tumors reveal plasticity of adipose derived stem cells. Breast Cancer Research, 18:32. Chen F; Hochleitner G, Woodfield T, Groll J, Dalton PD, Amsden B (2016) Additive Manufacturing of a Photo-Cross-Linkable Polymer via Direct Melt Electrospinning Writing for Producing High Strength Structures. Biomacromolecules, 17, 208–214. Groll J, Boland T, Burdick J, Blunk T, Choo D-W, Dalton PD, Derby B, Forgacs G, Li Q, Mironov VA, Moroni L, Nakamura M, Shu W, Takeuchi S, Vozzi G, Woodfield TBF, Xu T, Yoo JJ, Malda J (2016) Biofabrication: Reappraising the definition in an evolving field. Biofabrication, 8, 013001. Haigh JN, Chuang Y-M, Farrugia B, Hoogenboom R, Dalton PD, Dargaville TR. (2016) Hierarchically Structured Porous Poly(2-oxazoline) Hydrogels. Macromol Rapid Comm, 37, 93–99. Führmann T, Mousumi G, Otero A, Goss B, Dargaville TR, Pearse DD, Dalton PD. Peptide-functionalized polymeric nanoparticles for active targeting of damaged tissue in animals with experimental autoimmune encephalomyelitis. Neuroscience Letters (accepted). Hochleitner G, Jüngst T, Brown TD, Hahn K, Moseke C, Dalton PD, Groll J (2015) Additive Manufacturing with Sub-micron Melt Electrospun Filaments. Biofabrication. 7, 035002. Jüngst T, Muerza-Cascante ML, Brown TD, Standfest M, Hutmacher DW, Groll J, Dalton PD. (2015) Melt Electrospinning onto Cylinders: Effects of Rotational Velocity and Collector Diameter on the Morphology of Tubular Structures. Polym Int. DOI 10.1002/pi.4948. Visser J, Melchels FPW, Jeon JE, van Bussel EM, Kimpton LS, Byrne HM, Dhert WJA, Dalton PD, Hutmacher DW, Malda J. (2015) Strengthening hydrogels using three-dimensionally printed microfibers. Nature Communications, DOI: 10.1038/ncomms7933. Dalton PD, Muerza-Cascante ML, Hutmacher DW. (2015) Tissue Engineering Scaffold Design and Fabrication via Melt Electrospinning. In Electrospinning: Principles, Practice and Possibilities. GR Mitchell, RCS Publishing, ISBN: 978-1-84973-556-8, pp 100-120. Muerza-Cascante ML, Haylock D, Hutmacher DW, Dalton PD. (2015) Melt Electrospinning and Its Technologization in Tissue Engineering. Tissue Engineering B Rev. 21, 187-202. Dalton PD, Harvey AR, Oudega M, Plant GW (2015) Chapter 17: Tissue Engineering of the Nervous System. In Tissue Engineering. 2nd Edition, De Boer & Van Blitterswijk, Academic Press. ISBN 9780124201453, pp 583-625. 12. Hutmacher DW, Woodfield T, Dalton PD (2015) Chapter 10: Scaffold Design and Fabrication. In Tissue Engineering. 2nd Edition, De Boer & Van Blitterswijk, Academic Press. ISBN 9780124201453, pp 311-346. Thibaudeau L, Taubenberger AV, Holzapfel BM, Quent VM, Führmann T, Hesami P, Brown TD, Dalton PD, Power CA, Hollier B, Hutmacher DW. (2014) A tissue engineered humanized xenograft model of human breast cancer metastasis to bone, Dis Mod Mech, 7, 299–309. Shulte VA, Alves DF, Dalton PD, Möller M, Lensen MC, Mela P (2013) Microengineered PEG hydrogels: 3D scaffolds for guided cell growth, Macromol Biosci, 13, 562–572. Volpatto F, Führmann T, Migliaresi C, Hutmacher DW, Dalton PD. Using extracellular matrix for regenerative medicine in the spinal cord. Biomaterials, 34, 4945-55. Farrugia B, Brown TD, Hutmacher DW, Upton Z, Dalton PD, Dargaville TR. (2013) Dermal fibroblast infiltration of poly(ε–caprolactone) scaffolds fabricated by melt electrospinning in a direct writing mode. Biofabrication 5, 025001. Dalton PD, Vaquette C, Farrugia B, Dargaville TR, Brown TD, Hutmacher DW. (2013) Electrospinning and Additive manufacturing: converging technologies. Biomater Sci, 1, 171. Garland P, Broom LJ, Quraishe S, Dalton PD, Newman TA, Perry VH. (2012) Soluble axoplasm enriched from injured CNS axons reveals the early modulation of the actin cytoskeleton. PLoS ONE,7, e47552. Brown TD, Vaquette C, Hutmacher DW, Dalton PD (2012) Electrospinning for Regenerative Medicine. In Dumitriu, S. and Popa, V. (Eds. ), Polymeric Biomaterials: Structure and Function, Vol. 1, pp 539-592. Boca Raton, FL: CRC Press. Brown TD, Dalton PD, Hutmacher DW. (2011) Direct Writing by Way of Melt Electrospinning.Advanced Materials, 23, 5651-57. Cui W, Chang J, Dalton PD (2011) Electrospun Fibers for Drug Delivery. In P.Ducheyne, K.E. Healy, D.W. Hutmacher, D.W. Grainger, C.J. Kirkpatrick (eds.). Comprehensive Biomaterials vol. 4, pp. 445-462 Elsevier. Grafahrend D, Heffels K-H, Beer M, Gasteier P, Möller M, Boehm G, Dalton PD, Groll J (2010) Degradable polyester scaffolds with controlled surface chemistry combining minimal protein adsorption with specific bioactivation. Nature Mater, 10, 67-73. Johnston AH, Dalton PD, Newman TA (2010) Polymersomes, smaller thank you think: ferrocene as a TEM probe to determine core structure. J Nanopart Res, DOI 10.1007/s11051-010-9886-5. Dalton PD, Woodfield T, Hutmacher DW (2009) Snapshot: Polymer scaffolds for tissue engineering.Biomaterials, 30, 701-702. Klinkhammer K, Seiler N, Grafahrend D, Gerardo Nava J, Mey J, Brook GA, Möller M, Dalton PD, Klee D (2009) Deposition of electrospun fibers on reactive substrates for in vitro investigations.Tissue Eng Part C, 15, 77-85. Gerardo Nava J, Klinkhammer K, Seiler N, Mey J, Klee D, Möller M, Dalton PD, Brook GA (2009) Neural and glial interactions with electrospun nanofibers in vitro. Nanomedicine,4, 11-30. Dalton PD, Hostert C, Albrecht K, Möller M, Groll J (2008) Structure and properties of urea crosslinked star poly(ethylene glycol-ran-propylene oxide) hydrogels. Macromol Sci, 8, 923-931. Grafahrend D, Lleixa Calvet J, Klinkhammer K, Salber J, Dalton PD, Möller M, Klee D (2008) Control of protein adsorption on functionalized electrospun fibers. Biotech Bioeng, 101, 609-621. Anderson M, Johnston AH, Newman TA, Dalton PD, Rask-Andersen H (2008) Internalization of nanoparticles into spiral ganglion cells. J Nanoneurosci, 1, 1-10. Hutmacher DW, Woodfield T, Dalton PD, Lewis JA (2008) Scaffold Design and Fabrication in Tissue Engineering. C Van Blitterswijk, P Thomsen, A Lindahl, J Hubbell, D Williams, R Cancedda, J de Bruijn and J Sohier (Ed.) Academic Press. p403-450. Dalton PD, Harvey AR, Oudega M, Plant GW (2008) Tissue Engineering of the Nervous System, inTissue Engineering. C Van Blitterswijk, P Thomsen, A Lindahl, J Hubbell, D Williams, R Cancedda, J de Bruijn and J Sohier (Ed.) Academic Press. p611-647. Grafahrend D, Lleixa Calvet J, Salber J, Dalton PD, Möller M, Klee D (2008) Biofunctionalised nanofibers based on resorbable poly(ethylene glycol)-b-polyesters for tissue engineering. J Mater Sci Mater Med, 19, 1479-1484. Schäfer K, Thomas H, Dalton PD, Möller M (2007) Nanofibres for filter materials in Multifunctional Barriers for Flexible Materials, S Duquesne, C Magniez & G Camino (Eds.) Springer-Verlag, Heidelberg, Vol 97, Chapter 7, S. 125-138. Tsai E, Dalton PD, Shoichet MS, Tator CH (2006) Matrix inclusion within synthetic hydrogel guidance channels improves specific supraspinal and local axonal regeneration after complete spinal cord transaction. Biomaterials, 27, 519-533. Midha, R, Munroe CA, Dalton PD, Shoichet MS, Tator CH (2003) Growth factor enhancement of peripheral nerve regeneration through a novel synthetic hydrogel tube. J Neurosurg, 99, 555-565. Flynn L, Dalton PD, Shoichet MS (2003) Fiber templating of poly(2-hydroxyethyl methacrylate) for neural tissue engineering. Biomaterials, 23, 4265-4272. Karp, JM, Dalton PD, Shoichet MS: “Scaffolds for Tissue Engineering” MRS Bulletin on Cellular Solids, 28: 301-306, 2003. Luo Y, Dalton PD, Shoichet MS (2001) Novel poly(HEMA-MMA) hydrogel hollow fiber membranes: morphology and properties. Chem Mater, 13, 4087-4093. Dalton PD, Vijayasekaran S, Shoichet MS: Processing of Polymer Scaffolds: Polymerization. In Methods of Tissue Engineering, Academic Press, San Diego, CA, 725-731, 2001. Dalton PD, Shoichet MS (2001) Creating porous tubes by centrifugal forces for soft tissue applications. Biomaterials, 21, 2661-2669. Midha R, Shoichet MS, Dalton PD, Cao X, Munro CA, Noble J, Wong MKK (2001) Tissue engineered alternatives to nerve transplantation for repair of peripheral nervous system injuries. TransplantProc, 33, 612-615. Lou X, Dalton PD, Chirila TV (2000) Hydrophilic sponges based on 2-hydroxyethyl methacrylate. VII. Modification of sponge characteristics by changes in reactivity and hydrophilicity of crosslinking agents. J Mater Sci Mater Med, 11, 319-325. Hicks CR, Crawford G, Chirila TV, Wiffen S, Vijayasekaran S, Lou X, Fitton JH, Maley M, Clayton AB,Dalton PD, Platten S, Ziegelaar B, Hong Y, Russo A, Constable IJ (2000) Development and clinical assessment of an artificial cornea. Prog Retin Eye Res, 19, 149-170. Chirila TV, Higgins B, Dalton PD (1998) The effect of synthesis conditions on the properties of poly(2-hydroxyethyl methacrylate) sponges. Cell Polym, 17, 141-162. Chirila TV, Hicks CR, Dalton PD, Vijayasekaran S, Lou X, Hong Y, Clayton AB, Ziegelaar BW, Fitton JH, Platten S, Crawford G, Constable IJ (1998) Artificial cornea. Prog Polym Sci, 23, 447-473. Chirila TV, Hong Y, Dalton PD, Constable IJ, Refojo MF (1998) The use of hydrophilic polymers as artificial vitreous. Prog Polym Sci, 23, 475-508. Hong Y, Chirila TV, Vijayasekaran S, Shen W, Lou X, Dalton PD (1998) Biodegradation in vitro and retention in the rabbit eye of crosslinked poly(1-vinyl-2-pyrrolidinone) hydrogel as a vitreous substitute. J Mater Sci Mater Med, 39, 650-659. Clayton AB, Chirila TV, Dalton PD (1997) Hydrophilic sponges based on 2-hydroxyethyl methacrylate. III. Effect of incorporating a hydrophilic crosslinking agent on the equilibrium water content and pore structure. Polym Int, 42, 45-56. Hicks CR, Chirila TV, Dalton PD, Clayton AB, Vijayasekaran S, Crawford GJ, Constable IJ (1996) Keratoprosthesis: preliminary results of an artificial corneal button as a full-thickness implant in the rabbit model. Aust NZ J Ophthalmol, 24, 297-303. Crawford GJ, Chirila TV, Vijayasekaran S, Dalton PD, Constable IJ (1996) Preliminary evaluation of a hydrogel core-and-skirt keratoprosthesis in the rabbit cornea. J Refract Surg, 12, 525-529. Hong Y, Chirila TV, Vijayasekaran S, Dalton PD, Tahija SG, Cuypers MJH, Constable IJ (1996) Crosslinked poly(1-vinyl-2-pyrrolidinone) as a vitreous substitute. J Biomed Mater Res, 30, 441-448. Vijayasekaran S, Chirila TV, Hong Y, Tahija S, Dalton PD, Constable IJ, McAllister I (1996) Poly(1-vinyl-2-pyrrolidinone) hydrogels as vitreous substitutes: Histopathological evaluation in the animal eye, J Biomater Sci Polym Ed., 7, 685-696. Dalton PD, Jefferson A, Hong Y, Chirila TV, Vijayasekaran S, Tahija S (1995) Fourier transform infrared spectrometry as a tool to assess the retention of polymeric vitreous substitutes. Bio-Med Mater Eng, 5, 185-193. Dalton PD, Chirila TV, Hong Y, Jefferson A (1995) Oscillatory shear experiments as criteria for potential vitreous substitutes. Polym Gels & Netw, 3, 429-444. Chirila TV, Constable IJ, Hong Y, Vijayasekaran S, Humphrey M, Dalton PD, Tahija SG, Maley ML, Cuypers MH, Sharp C, Moore SR, Vague MJ (1995) Synthetic hydrogel as an artificial vitreous body – A one year animal study of its effects on the retina. Cell Mater, 5, 83-96. Chirila TV, Vijayasekaran S, Horne R, Chen Y-C, Dalton PD, Constable IJ, and Crawford GJ (1994) Interpenetrating polymer network (IPN) as a permanent joint between the elements of a new type of artificial cornea. J Biomed Mater Res, 28, 745-753.